Cook the linguine for 6 minutes in salted water and 6 minutes in the red cabbage extract, then stir in some extra virgin olive oil. Blend the burrata to obtain a cream. Cut the smoked herring into small, fine slices. Toast the pine nuts in the oven at 180 °C for 10 minutes. Use the small leaves only. 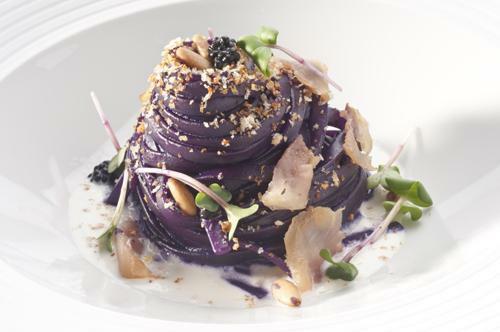 Place the burrata on a plate, followed by the pasta, the herring, the pine nuts and the cress.